Mystery Cookbook Game Review - Download and Play Free Version! Objects are food related, realistic, and well hidden. The hints are especially helpful for the tough to find objects. Finding hidden objects can be tedious. Help Mousy Become A Skilled Chef! Mousy dreamed of one day mastering the fine art of professional cooking, even if he was just a rodent. Help him achieve this lofty goal and meet a variety of interesting animal characters, including a grumpy bulldog, an entertaining parrot, a depressed goose and much more. Search through 55 levels to find a variety of different objects, such as grapes, jars, apples and wine glasses. Collect the pages and chapters of the secret cookbook and complete Mousy's culinary training! Fans of hidden object games will easily catch onto the gameplay mechanics in Mystery Cookbook. Players are presented with busy scenes, such as untidy kitchens or littered restaurants, and given the task of finding a number of items. Sometimes the list of items is presented in words while other levels show you silhouettes of the items to find. You have to find all of the items, including special story-tied items, before the time runs out or you'll have to replay the level. Click on the wrong spot too many times and you'll get a 20-second penalty. If you get stuck, there's a cheese platter hint button that locates one item from your list, and in order to replenish this plate you can find bits of cheese hidden throughout the levels. Mystery Cookbook dishes out some fun hidden object gameplay that can be challenging at times yet easy enough that players new to the genre can pick it up and have a good time. You'll put your searching skills to the test as you make your way through this humorous tale of greedy students and provocative critters. Besides the regular gameplay, there are six types of mini games that show up every couple of levels. 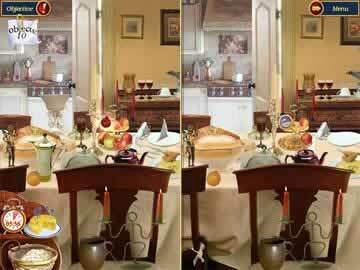 Enjoy a fun diversion with tile puzzle challenges that require you to rotate blocks to form a scene, spot the differences between two similar images, or find a specific number of similar items in a scene, such as cheese or cups and plates. If you like hidden object games filled with zany characters, then download Mystery Cookbook and begin the search today! Mystery Cookbook is not the most sanitary of cooking games as you help the main character, Mousy the mouse, become a top chef, getting advice from other animals like cats, birds, and fish. Mousy, the protagonist mouse in this hidden object game, wants to be the greatest chef in the world. Through helping him find the lost chapters of a cookbook, Mousy learns the art of cooking and becomes the best. This hidden object game will keep you busy with it's mini-games and alterations on the typical hide and seek game. Starting the game you learn of the most prized cookbook in the history of the world. It was compiled by the greatest chef to date and was divided by chapter upon his death. Now the chapters are scattered throughout the world and the book is rendered nearly useless. Through traveling from restaurant to restaurant you help Mousy uncover the lost chapters, eventually piecing the book back together, using it to become the best. This is a hidden object game so each level and restaurant you enter will have you looking throughout the kitchen for buried items and other prized possessions. 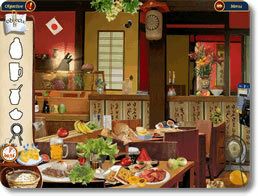 As far as these types of games are concerned, Mystery Cookbook incorporates a great theme and has well-hidden objects. The gameplay of this game is divided into several formats. The storyline is carried through the hidden object games, while variations and other mini-games are also incorporated. Each level of finding poses one of three options. You will be asked to find all the items on a list. The list might include cherries, apricots, onions, and other food related objects. The second option is a silhouette list. Rather than list the individual items, this option lists white silhouetted pictures of the objects. You might see the outline of a cup or fork in this mode. The third option, which tends to be the least frequent, is to find all of a certain object. You might be asked to find all the spoiled pastries or you might have to organize the kitchen by finding all the flatware. Whatever the task may be, the third option has you finding all of the objects in a certain category. So you don't get confused or wonder how many objects you have remaining to find, a counter is located at the top left corner of the screen. There are also six mini-games for you to play. These come up at varying intervals and can be anything from rearranging 25 pictures on a 5x5 grid to finding the differences between two pictures. The mini-games are a great way to break up the monotony hidden object games are sure to bring. One of the major drawbacks of the game can be seen in the sometimes confusing item descriptions. For example, if you are playing the list option you might be asked to find a can or pot. The can is actually a jar and the pot is a clay pot, not one of the three cooking pots on the stove. These vague descriptions are really confusing and make the game frustrating, as clicking on the incorrect items can lead to a 20 second penalty. Another drawback, which was briefly mentioned earlier, is tediousness. This game can easily get tedious because there is little to no variation in gameplay. Yes, the mini-games help, but they don't do enough to break up the inevitable monotony associated with the hidden object genre. Overall, Mystery Cookbook is a fun game for casual hidden object players. The find and seek elements of the game are interesting and the storyline is engaging, making you want to find the recipes for Mousy. Though there are some shortcomings with the descriptions and monotony, fans of the genre should not find this to be too big of a problem and will certainly enjoy this title. 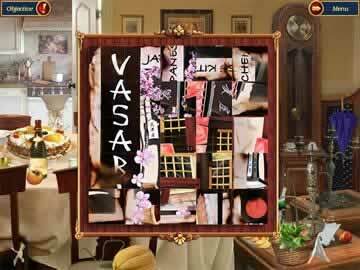 Check out some of the hidden object variations and a few of the locales that you can enjoy in Mystery Cookbook.